I finally found out what the collection is called and it's Go with the Flow-er. Again, I found this at CVS and apparently it's pretty new. Let me know if you've found it at your local store! Save Water, There's a Drought is a gorgeous blue/green metallic shimmer that reminds me of a mermaid's fins. Like the lilac color from last night, you really need to be careful of brush stokes, but otherwise the formula was fine. My Transdesign order was delivered today, but nobody was home. *cries inside* I guess I'll have something to look forward to when I get home tomorrow. I'm really excited about showing some new collections since I've been showing a lot of drugstore polishes lately. Wet N Wild Wet N Wild Go With the Flow-er Collection: Why Would I Lilac to You? For the life of me I cannot remember the limited edition collection this polish came from! I actually have three to show you all, so hopefully it comes to me or some kind reader reminds me. I found it at my local CVS a little over a month ago. Like other drugstore polishes with limited edition collections, you never know what your local store is going to get, unfortunately. For example, I really wish people could find the Sinful Colors Adventure Island collection I posted the other week. I'm also happy to report that my (rather large) nail polish haul from Transdesign has shipped. It feels like forever since I've been truly excited about any polish collections. Leave it to fall to have new and exciting colors. Why Would I Lilac to You? is not very lilac in color if you ask me. It is much too dark to be a true lilac. Either way, for the dollar-something I paid for this it was well worth it. I've been a big fan of Wet N Wild polishes since I was a little girl and I'm happy they're still chucking out polishes I like. Application and formula was fine, but slightly brushstroky so make sure to have a steady hand when applying. Oh man, I just need to get some of these because they are just too cute! Have you seen these in stores yet? THINK: Spooky style at your fingertips—just peel, apply, file, and go. 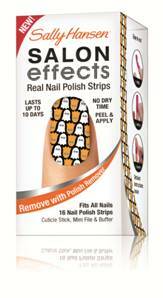 WHAT IT IS: No dry-time, nail polish strips for instant Halloween hands. This fall, make a chic seasonal statement with Sally Hansen Nail Polish Strips in new Halloween-inspired prints. Sally Hansen Nail Polish Strips offer DBP, Toluene and Formaldehyde Free, no dry-time nail looks for style that lasts up to ten days. This easy and affordable at-home nail technology takes your Halloween costume to the next level. WHAT THEY COST: $9.99 each. Has anyone ever had a little area on their finger (mine is on my index finger on the thumb side) that is perpetually dry? I moisturize with nourishing lotion and butters to no avail. One theory is that my hands are just getting sensitive to harsh hand soaps so I ended up buying some SLS free soap. If anyone has had anything like this before, please let me know. The rest of my hands are just fine for the most part. I spent most of my time (and money!) at Ikea today. After moving into our new place, we decided that we needed a few new pieces for the apartment. I wish the weekends didn't fly by so fast! Have you heard of the new brand of polishes at Ulta called Pixel? They are really small bottles (5 mL) that run for $2.49, I think. Oh Boy!! is a frosty pink polish with lots of holographic glitter. So far, I have a few problems with this one. First, the price for the amount of product. Come on, I've never heard of your brand before, why the pricey polishes? The second problem is the extremely short brush it has. I swear, I used just three coats for this one and I feel like I'll have to be tilting the bottle to get polish on the brush next time. A few of the other polishes looked nice, but the downfalls may prohibit me from doing so. Did you have a good Friday night? My boss had a few people over last night and delicious food was had and fun games were played. I swear, I meant to blog last night! As promised, I finally found the final swatch from the Sinful Colors Adventure Island collection called Rise and Shine. I think it may be a part of the permanent collection though (please correct me if I'm wrong). It's a beautiful kelly green polish with fine microshimmer that really sets it apart from the common green creme. The application and formula was great as well. So, now that you've seen all the swatches I have to offer, what do you think of this collection? I hope you're having a fun weekend so far! Can you believe it's almost Friday already? I've been out in the field sampling for my job this week, hence me falling behind on the posts. I just wanted to mention that Barielle is having a 30% off sale until August 26th, so if you are on the lookout for some polishes, stop on by to their website. Don't forget, their polishes are also buy 1 get 1 50% off every day. Wait, hold up! Is that a (semi) holographic polish that retails for only $1? I hesitate to call it a full on holo polish, but it's good enough for me (for the price). It was slightly sheerer than other Essence polishes, needing 3 coats instead of the 2 normally needed. Other than that, I had no application issues with this one. If you want true holo goodness, you will need to look elsewhere, but I'm definitely proud of Essence for this polish. I was hoping to show the final Sinful Colors polish tonight, but I just realized that the pictures are still on the memory card....and my camera still hasn't been unpacked. Oops! I'll show that one as soon as more of our crap has been put away. I've been waiting a few weeks to show today's color and I hope you love it as much as I do. It's quite rare for me to purchase polishes from Sephora by OPI due to their high price ($9.50), but I just had to get my hands on Caught with my Khakis Down. It comes from the Safari Luxe collection and is a dusty khaki green polish that is just gorgeous. Unlike the regular OPI polishes, the Sephora by OPI brushes are not the Prowide ones which may make some happy (not me, I actually like the wide ones). The application and formula was superb, which I would expect from a polish retailing for over $9. Are you a fan? Ah, I'm so happy to be back with all of you! This past week was pretty crazy, and I hope things start to settle down soon. All it takes is a few days off to really get me excited about blogging again. I'm not going to lie, I usually spend my weekends sleeping so all that packing and heavy lifting has left me pretty exhausted. My apologies, I sound like such a whiner right now. Remember how I was saying weeks ago that I couldn't wait to get my hands on some fall collections? Well...I haven't gotten any yet, but I hope to make an order tonight for some China Glaze, OPI, Essie, Color Club and Orly polishes. I found the Orly Mineral Fx polishes at Ulta the other day, but there is absolutely no way that I'm paying $10 for Orly polishes. The second to last polish I have from the Sinful Colors collection is where the collection got its name, Adventure Island. It's one of those it's-so-ugly-it's-awesome colors that comes straight from appliances from the 60s and 70s. It's got a base of green with lots of yellow tones (do I hear baby poop green?). I don't care, I think it's unique and a pretty awesome color, especially for a drugstore brand. Sinful Colors, despite ripping off OPI on a few of the colors, you still did a great job with this collection (*golf clap*). Again, I'm so glad to be back and thanks for sticking with me! Whew, it's been an exhausting few days! My apologies for the lack of updates, but I was moving into my new place this weekend! I'm so glad it's over, but I'm not looking forward to all the unpacking we have to do. I just wanted to poke in and say hello, and that I will be posting later tonight. I hope you guys had a great weekend a good start to the new week. Sorry, but it's going to be another post on the fly. I've been a working and packing machine, which has left little time for blogging. Don't worry, I will be back in full swing soon. I only have a couple more polishes from the Adventure Island collection, but not all of them are new. For example, Beautiful Girl was a part of the Pretty in Pink collection earlier this year, but I'm not sure if it's a part of the permanent collection. If anyone knows, please feel free to let me know. This one does not correspond to any of the colors from the Pirates of the Caribbean collection because it's a little brighter than all of those. That's not to say that this color is neon or anything, it's just bright. Hold up, someone told me that Sinful Colors are only $1 at Walgreens this week. Needless to say, I high tailed it over there to get in on that action. For a buck, you cannot go wrong with this drugstore brand. I must admit that I am extremely exhausted tonight so this is a quick post. Sinful Colors Seaweed polish is pretty much a dupe for Stranger Tides, but Seaweed may be slightly darker. Again, they are so close that I wouldn't bother with Stranger Tides. I have a question for all of you out there. Do you like that Sinful Colors came out with an almost identical collection to OPI, or do you think they shouldn't copy and get their own colors? I'm interested to hear your input. If you have left a comment the last few days, it hasn't gone unnoticed. I have been so busy with work and moving that I haven't had the chance to reply. I'm getting to it though, I promise! Ah, yes, another very close dupe of an OPI polish. Remember when I posted Sparrow Me the Drama a few weeks (perhaps even a month or 2?) ago? Man, time really has been flying by this summer. The kids will be back at school before you know it. The school where I work starts up this coming Wednesday and I'm already dreading the parking situation? Why can't any university have ample parking? Anyway, Sinful Colors Star Fish looks extremely close to Sparrow Me the Drama...so close that I would again suggest the cheaper alternative (if you happen to find it, which is apparently difficult). If you're looking for a nice Pepto Bismol pink creme, Star Fish is where it's at. I haven't done direct comparisons, but I hope the pictures together give you a good picture of how similar they are. Did you have a good weekend? I spent most of mine packing up to move (blarg). Have I mentioned I hate moving? Happy Saturday! Man, I take an extra day off this week because my sister-in-law visited from Texas and my parents thought something happened to me. I guess you most of you guys expect at least 5 swatches a week, and I don't blame you. I used to blog every single day, but I started to get overwhelmed. I find that if I take a couple days off, my blogging is better than if I do it every day. I hope you guys can understand. While packing for our big move today I found a hidden gem from Maybelline called Red Comet. I'm going to do a swatch tonight, but it appears to be very similar to China Glaze Ruby Pumps. Have you ever heard of this polish because I can't even remember buying it! Continuing on with the Adventure Island collection is Easy Going, which I believe is a part of their permanent collection. Since they don't seem to have a polish similar to Steady as She Rose, I think they just tagged this one on here because it has that same pale pastel color. Easy Going is a very pale pink creme that I hoped wouldn't appear white on my nails. I'm happy to report that you can definitely tell it is pink! Out of all the polishes from the collection, I think this one was my favorite. Just look at how awesome it looks! Was it a streaky mess? No! It was slightly thick and very pigmented with no streaking at all. I'm so happy to have found this one (and for only $1.99 from Rite Aid). Did you decide against the OPI Pirates of the Caribbean collection that came out a few months ago? I purchased most of the collection and I can almost kick myself because Sinful Colors came out with a collection that looks a lot like the OPI polishes. You may remember one of my favorites called Mermaid Tears, and as you can see from the photos, it looks eerily similar to Sinful Colors Open Seas. They are both dusty green polishes with a hint of blue. I don't think I can call them exact dupes though since Open Seas is a bit greener and Mermaid Tears has a bit more blue. I can honestly say that both are quite lovely, but when taking price into consideration, I'd have to go with Open Seas. Despite being a drugstore brand, the application and formula was wonderful. I found the collection at my local Rite Aid after looking a few times at Walgreens. They retail for $1.99 and periodically go on sale if you can hold off that long.